A significant fire in the building in 1981 required an almost complete rebuild. Since then staff numbers have been incrementally increasing from 15 to 40 with people working on different floors, different buildings, in a fragmented workplace. After an exhaustive search for alternate office space it was decided that the centrality of the office was unique and that we would refurbish. To enable this required a solution that would create smaller workstations so that all staff were on the one floor, working intimately and collaboratively. However, additional area was also still required which was found by expanding into the adjacent 1860‘s workers cottage separated from the original office by an 1800mm gap. 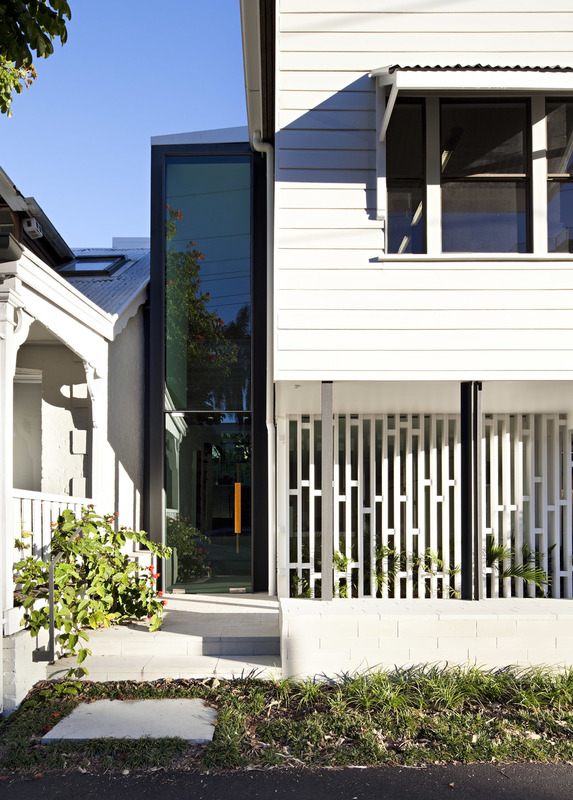 In Queensland, the detached house creates an often almost unusable space on its side boundaries. The Practice wanted to shift from the existing strong association with the residence and play with the idea of developing a distinct entrance and organising element around this often-neglected interstitial space between the two buildings. This new inserted piece completely envelops the facade of both buildings and allows their history to be clearly legible. The charred remains of the burned timber frame were revealed and celebrated as a direct connection back to the Practice’s 1981 fire. The original brick chimney of the cottage, which once supported a corrugated kitchen lean-to, stands now as an isolated sentinel. New openings in the friable brick and mortar of the adjacent 1864 workers’ cottage were left unpainted and raw to articulate where the fabric was modified.